Andrew was born in 2004 with a condition called ‘Ulna dysplasia’. Basically, your forearm is made of two bones (ulna and radius) but Andrew was born with only one of the two bones (the radius) in both of his arms. Along with this condition, his hands were not formed properly. His left hand has two fingers and his right has only one finger. When there is only one bone in the arm, sometimes the bone develops a curve to it, such is the case with Andrew. Both arms have a slight “C” shaped curve to them. Both of Andrew’s arms have one continuous bone from the shoulder to the wrist, which causes his biggest challenge since he does not have elbows in either arm, he is unable to bend his arms. (Try going 5 minutes in your day without being able to bend your arms, you’ll be amazed) The severity of this condition is rated on a scale of 1 to 4 (4 being the most severe) and Andrew’s case is considered a 4. Depending on his mood, if somebody asks Andrew about his hands, he may reply with “I was born this way” or he may reply with “an alligator bit them off” or about how he was attacked by a shark. Andrew’s oldest brother, Jacob, has been racing quads with TQRA for three years now (starting in the Pee Wee Jr. class) and it has been Andrew’s goal to follow in his brother’s footsteps and race quads as well. Like his brother, Andrew started out on the battery powered “Powerwheels” 4-wheeler and as he got more comfortable on it, I began making modifications to the motors and gearboxes to make it faster for him. 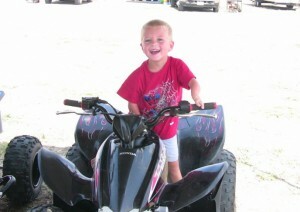 He was actually able to race on it at a local track (Boondoxxx MX) during intermissions in a “Powerwheels race”. Of course, since his was modified and faster than ‘stock’, he didn’t have much competition and won several 1st place plaques and trophies. It wasn’t long until he outgrew the Powerwheels quad and started asking for a “real” quad like me (his dad) and his brother had. 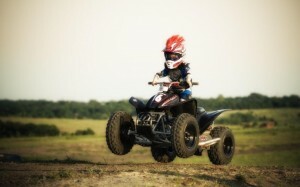 At the time, we had a Honda TRX 90EX, but he was too small for it and with the thumb throttle, he had no way to accelerate the quad and steer safely at the same time. That’s where Dave Carter from DC Motorsports and atvriders.com came into the picture. I met Dave through the website and he heard about Andrew’s desire to ride and wanted to help. He made arrangements to have the Honda delivered to his shop in Arkansas where he began work on it. He made the throttle so that it could be foot controlled (just like his Powerwheel quad was) and removed the thumb throttle. We talked quite a bit over the phone and had it designed so that he could gas the quad and still be able to shift gears on it as he progressed and learned to shift. When we arrived to pick up the quad, Andrew was still a bit too short to reach the pegs well enough to control the quad. Dave quickly made foot peg adapters for the nerf bars, foot throttle and foot brake so that Andrew could ride it before we left to come back home to Dallas. For the next few months (over a year, actually) Andrew would control the gas and brakes while I rode on back with him to steer and teach him how to control the quad. The handlebars were still too far away for him to reach comfortably, which is when Kenny Vaughn from K-fab came into the picture. Both Dave and Kenny were excited to work on Andrew’s quad. Kenny made a set of custom handlebars that are 1” lower, 2” shorter width and sit 4” back closer to the seat. He was now able to gas, brake and steer all on his own. Mark from Fox suspension caught word of Andrew and his quad and he wanted to help in the build as well. Mark sent a full set of mountain bike air shocks that fit perfectly on the stock suspension which added about 2 more inches of travel on the front of the quad over the stock shocks. It was several more months that I continued to ride on back with him while he controlled the quad before I decided he was ready to take his first solo ride by himself without me on the back. We practiced in a flat, dirt area at Boondoxxx and I had him drive 10-15’ then stop and start again. Then we worked on ‘figure 8’s’. I had him follow me while I jogged around making him do left turns, right turns and stops. From there, he went to the kids track and I ran behind him while he made his first lap, flawlessly! After that, I stopped and let him go by himself and he did 5 more laps. To say he was excited would be a huge understatement. He called Dave Carter on the way home to tell him the news. From then on, he’s been riding anywhere and everywhere he wants to go. He’s even done 1-2 hour long trail rides with me, his brother, and fellow TQRA racer, Cory Gonzalez, through creeks, up hills, down hills, over logs and through mud holes. He went everywhere we went and had the most fun out of all of us. His next mission was to race. We talked to the track owners at Boondoxxx and after talking to the parents of the Pee Wee dirt bike riders, they agreed to let him race with the training wheels dirt bike class. 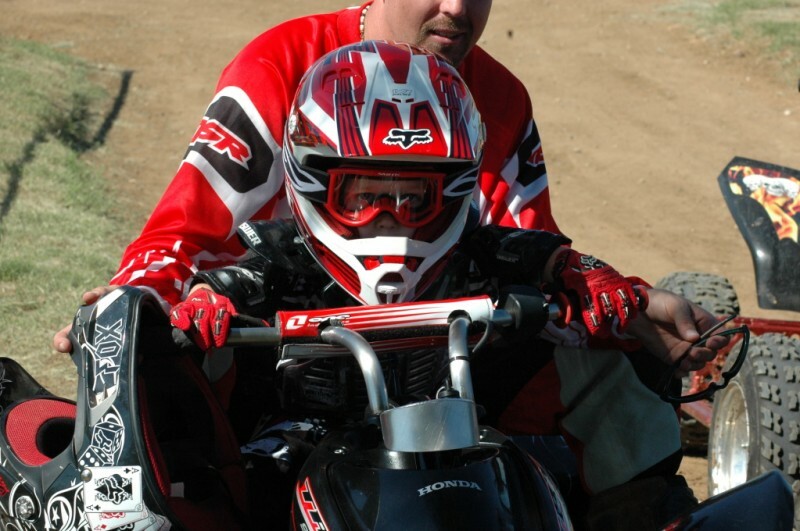 He rode several races and did great before we had one of the TQRA board members come out to watch him race. That is when we asked TQRA if we could enter Andrew in the Pee Wee Jr. class with TQRA. After watching his friends in TQRA and his brother race for 3 years, Andrew was the probably the most excited and determined to race out of any TQRA member. I want to say a special “THANK YOU” to TQRA for allowing him to race. He loves going to the races and his competitive drive is extraordinary. 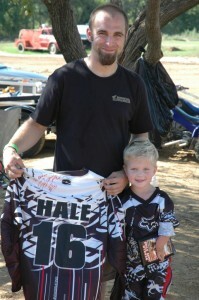 He looks up to all of our pro racers and has all of their posters (all autographed) hanging in his room. 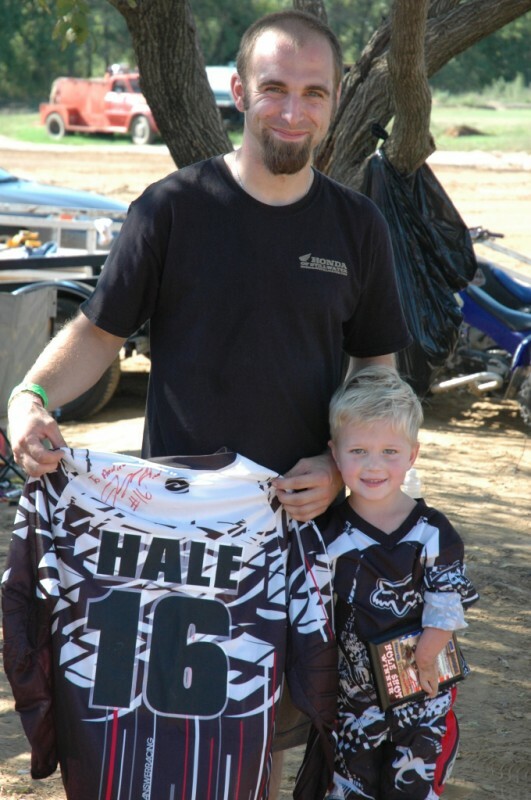 His favorite rider/racer is Johnny Hale and his favorite item in his room is the autographed Johnny Hale jersey. The names of pro racers, Johnny Hale, Hunter & Cody Miller, Chase & Cory Snapp, Thomas Brown and James Stewart lol are all in his everyday vocabulary. When he’s riding his bicycle, he’s usually pretending to be one of them in a race with his friends and brother. Thanks guys, he really looks up to all of you. 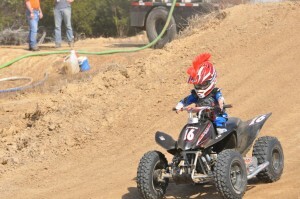 In round #5 of TQRA’s 2011 season, Andrew netted his first 1st place overall in the Pee Wee Jr. class! (6/12/11) We are so proud of him! As parents, we see and treat Andrew just like any other child. There’s very little he can’t do on his own, and he’ll be the last one to ask for help. But to others, we’ve been told many times how much of an inspiration he is (on and off the track). I wish I had half of the self confidence and determination he has, it’s truly amazing. He’s an inspiration to us as parents as well. It’s a feeling that words just can’t explain. Again, special thanks to TQRA, atvriders.com, Fox Shox, Dave Carter, Kenny Vaughn, JH Racing, Boondoxxx and all of the support from the TQRA families and friends we’ve come to meet over the years. That’s is really cool. Go andrew! We love our Andrew too!!! He is an inspiration to more than you know!